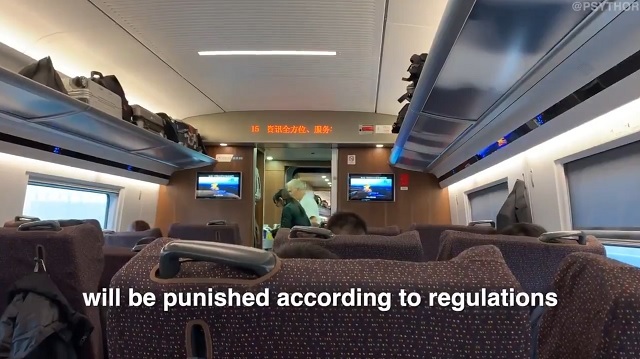 This Orwellian clip a visitor to China recorded while on the Beijing-Shanghai bullet train gives a solid picture of the type of future society our Big Tech overlords want to create in America. In the video a female voice announced over the intercom in English that people who travel without a ticket or "behave disorderly" — like smoking in public places — would be "punished according to regulations, and the behavior will be recorded in individual credit information system." It's not clear what the "orders" and "regulations" are. But previous government notices have focused on transport-specific offences like loitering at airport check-in desks and boarding gates. The social credit system is due to roll out in 2020, but various cities have launched pilot programs and a disparate collection of blacklists. It relies on information such as facial recognition software and getting citizens to report on each other to local authorities. People have already either been punished and rewarded based on their social credit: Earlier this year a student was denied his spot at university because his father was blacklisted for failing to pay off a 200,000-yuan ($28,700/£22,400) bank loan. Others have been banned from taking trains because of their score. On the other hand, those with good scores are given perks like not having to pay a cash deposit when booking hotels, or getting their profile boosted on a dating website. The eastern Chinese city of Jinan also started enforcing a social credit system for dog owners last year, whereby registered owners have to purchase a license, and have points on it deducted if they don't clean up after their dog or walk their pet without a leash. This is already happening to a lesser extent through Big Tech's deplatforming, demonetizing and deranking of right-wing voices and independent, anti-establishment websites. These unelected megacorporations are punishing us for expressing our dissident political views and taking away our ability to make a living just like the communist Chinese do with their social credit score. On the flip side, if you shill for the establishment they'll reward you with grants and artificially boost your reach with their rigged algorithms. Many of these same companies are trying desperately to get into China to help their government oppress their citizens. Why are we allowing these authoritarians to spy on us and control our data? They've shown time and time again they cannot be trusted. They're openly using their massive power to interfere in our elections and undermine our democratically elected president and his supporters. All these major Big Tech companies colluded together to ban people like Alex Jones and shut down their competition like Gab in what's clearly blatant antitrust violations. Beyond forcing these companies to respect the First Amendment, Steve Bannon's idea that their data should be seized and put in a public trust is certainly worthy of consideration.